Berdych’s first opportunity to put his stamp on the match came in the sixth game with two break point chances. However, Gasquet found the escape button on both occasions. Following a double fault by the Czech, Gasquet struck a sensational forehand volley for double break point. When a forehand stroke by Berdych landed wide, Gasquet bagged the break for 4-3. Later on after consolidating, Gasquet manufactured triple break point with a forehand crosscourt winner. As Berdych flubbed another forehand, his fifteenth mistake, the Frenchman claimed the opening set. Still dazed by Gasquet’s superb performance, another miscue by Berdych resulted in break point for his rival. 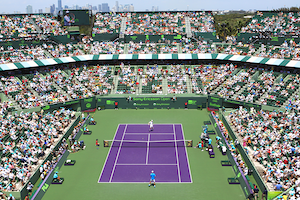 With a forehand crosscourt winner, Gasquet banked the break and held on to the next game for a 3-0 advantage. The rest of the evening, Berdych failed to fabricate another break point. Gasquet went on to sustain the single break difference to carry the second set. Although Berdych acknowledged that the conditions suited Gasquet’s game well and that he played a wonderful match. He also expressed “it’s not apologizing for myself, but, just too much tennis for me in the last seven weeks and my tank is empty completely. I was just trying to do my best, try to fight for it, but, Richard was stronger. He was playing very good, solid and so definitely he deserves to win”. 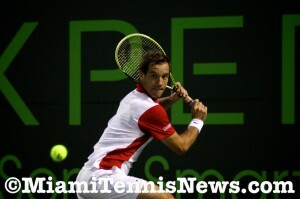 Gasquet is the first Frenchman since his coach Sebastien Grosjean, a finalist in 1999, to reach this stage in Miami. Gasquet is back in the top ten with two titles already this season. The Frenchman attributes his recent success to the fact that “my coach is telling me good things everyday”. The Frenchman employs two coaches “I think it’s good for me to change sometimes. Sebastien has a lot of experience. He played on the tour. He was one of the best players in the world. [Ricardo] Piatti is the same. He was coach of [Ivan] Ljubicic. So both have a lot of experience. Both are clever and I really like to practice with them”. Moreover, tactically, Gasquet stated both are on the same page “they have similar point of view on my game. I need to go more to the net, to play close to the baseline”. Looking ahead to his semifinal opponent Andy Murray, Gasquet cited “he has all the shots of tennis: serving well, returning incredible, running well. He’s one of the best attackers in the world. I think we played a lot of times already in the past, for sure he will be the favorite. I have nothing to lose and I will try to play a good match”. Gasquet made clear that the last statement does not imply he does not expect to win “I can play better, I’m more confident in my strokes. I can try a lot of things because I have nothing to lose, I can be very dangerous. I know I can win against Andy. . . I know his game. We did great matches in the past. I will do my best to win him”. The Frenchman is acutely aware that he has carried three of the seven meetings versus Murray. They have had some great battles in the past. Thus, the semifinals appear promising.